Finnish President: Trump Lied About Selling Us Jets - Joe.My.God. President Donald Trump loves to talk about trade deals. It was with fervor that he announced a new deal to supply Finland’s air force with “a large number” of F18 fighter jets from Boeing. 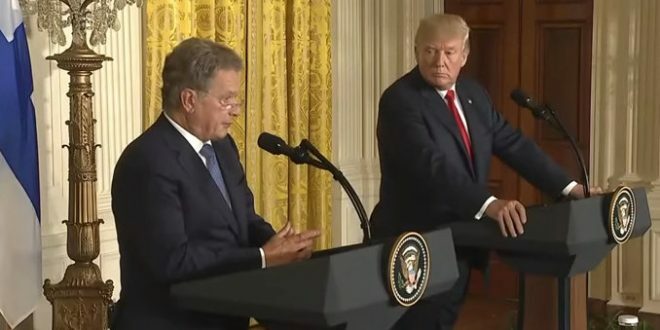 The news was a surprise to many, most of all Finland and its President Sauli Niinistö, who was sharing a podium with Trump as he made the announcement. The Finnish Defense Ministry quickly denied the deal and the president refuted Trump’s claim via Twitter. Finland is seeking to replace its current fleet of jets and procurement director Lauri Puranen told public broadcaster Yle that four other fighter jets besides the F18 are also under consideration, namely the Dassault’s Rafale, Eurofighter’s Typhoon, Lockheed Martin’s F-35 and Saab’s Gripenwho. One of the potential presidential candidates, Matti Vanhanen, criticized Niinistö for not responding to Trump immediately. Though the president looked surprised during Trump’s announcement he did not interject at the time, later tweeting and telling press that the deal for the F18s has not been agreed.